The Pharisees seize authority from the priests, the "traditions of the elders" replace the Bible, laymen claim to be prophets — these surprising facts are discussed in this ninth installment. THE last installment revealed how laymen came to power through "Judaism" — how they called pagan customs the "traditions of the elders." Now see what occurred in the century just before Christ's birth. The acceptance of the "traditional laws," supposedly handed down from Moses, placed the lay leaders in a position of power and authority among the people. It was the people themselves who had inherited the many new customs, and when the lay leaders condoned the customs, claiming them to be Jewish in origin, the people looked upon the lay leaders with honor and respect. The lay leaders were quite aware that there was no truth in their assertions that these new customs came from Moses. But in order to please the people they deliberately propagated this falsehood. In consequence of their newly found authority, the lay leaders set themselves up as ultimate teachers in matters pertaining to every phase of religious activity. In the matter of accepting the customs inherited from Hellenism, they maintained their prerogatives, as religious authorities, to decide which of the customs to accept and which ones to reject. "No one except the recognized teachers could say what the tradition contained" (Herford, Talmud and Apocrypha, p. 68). Of course, the customs to which the People were most wedded were necessarily accepted. Many of the priests in the Sanhedrin objected to the lay leaders' assumption of power and especially of their raising to divine law the new customs from Hellenism. The priests were also obstinate in their belief that the authority to rule should be accorded to them alone, for they properly maintained that they were the descendants of Aaron and the only ones recognized by Scripture to be in authority to rule over the people. But the lay leaders would not concede to the priests' demands, and they had the majority of the people behind them. Too many of the priests had deserted to outright Hellenism in the anarchial period and the people were still wary of their tactics. This breach between the two leading religious factions among the Jews was the beginning of two prominent New Testament Jewish sects: the Pharisees and the Sadducees. The lay leaders comprised the Pharisaic group. Most of the priests represented the Sadducees. Members from both groups remained in the Sanhedrin, but they were almost always divided on policy. It is not to be supposed that the whole Jewish population was anxious to get back to some form of religious observances after the period of religious anarchy. The great majority of people were not overly interested in religion. As stated before, 95% of the Jews in Christ's time were not members of the Jewish sects. This lack of real interest in religion among the Jews in New Testament times had its origin within the period of religious anarchy. THE JEWISH PEOPLE AS A WHOLE NEVER RECOVERED FROM THE CONDITION THAT EXISTED WITHIN THAT ANARCHIAL PERIOD. There was, of course, a limited amount of religious compunction, but not enough for the whole nation to become members in the sects of Judaism. "The Pharisees have delivered to the people a great many observances by succession from their fathers, AND ARE NOT WRITTEN IN THE LAWS OF MOSES; and for that reason it is that the Sadducees reject them, and say we are to esteem those observances to be obligatory which are in the written word, but are not to observe what are derived from the tradition of our fathers. 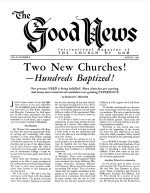 And concerning these things it is that GREAT DISPUTES AND DIFFERENCES have arisen among them, while the Sadducees are able to persuade none but the rich, and have not the populace obsequious to them, but the Pharisees have the multitude on their side" (Antiquities of the Jews, XIII, 10, 6). A major decision of the Pharisees was that of rejecting the sole authority of the priests to be the religious authorities. The Pharisees admitted that the priests were the only ones with the right to perform the ritualistic services in the Temple. But other than this minor role in directing the religious life of the people, the priests henceforth had little to do, religiously speaking. The Pharisees came to RECOGNIZE THEMSELVES as the only real religious leaders. In assuming the religious leadership, the Pharisees reasoned that they were taking the place of the priests whom they considered unfit to govern the people on account of their rejection of the traditional laws. "IT IS CERTAIN that they [the Pharisees] regarded themselves as the SUCCESSORS OF THE PROPHETS, and that not merely in fact BUT BY RIGHT" (Herford, Talmud and Apocrypha, p. 71). They had already accepted the new customs as divine law — and they reckoned that only individuals under the influence of the Spirit of God could do such things! In the Jewish Talmud, a compilation of Jewish writings from the days after Alexander the Great to about 400 years after Christ, there are several statements of these early Pharisees in regard to their belief that they had the same authority as the prophets. In the talmudical tractate called "Baba Bathra," in section 12a, we read this: "PROPHECY WAS TAKEN FROM THE PROPHETS AND WAS GIVEN TO THE WISE [the Pharisees]." To this remark is added: "AND IT HAS NOT BEEN TAKEN FROM THESE." Herford deduces from this particular reference, among many others in the Talmud: "The relevance of this passage... is that the Rabbis [the Pharisees] felt that they had, NO LESS BUT EVEN MORE THAN THE PROPHETS, DIVINE AUTHORITY FOR WHAT THEY TAUGHT, and that this was given to them after the time when the prophets ceased to function. It was the way of expressing the belief that the REVELATION DID NOT CEASE with the extinction of prophecy?? (Talmud and Apocrypha, p. 72). The audacious Pharisees considered their laws and commandments as having more weight than those of the Prophets! That divine revelation did not cease with the prophets, but was now in action in the Pharisees as well! They were confident that what they were teaching — even though in so many cases it did not agree with the plain and simple commandments of God as revealed in Scripture — was divine teaching as prompted by the Spirit of God. The Pharisees felt that God was "revealing Himself now as He had revealed Himself to the prophets, AND SPEAKING NOT ALONE IN THE WORDS OF AN ANCIENT TEXT, but in words which came FROM THE HEART AND CONSCIENCE OF MEN who felt His hand laid upon them to 'guide them into all truth'" (ibid., p. 69). Notice this! The Pharisees came to the place of believing that God did not reveal Himself in the Scriptures alone — "speaking not alone in the words of an ancient text" — but that He was actively revealing His present truth to the Pharisees through influencing their hearts and consciences! You can imagine what unlimited authority this gave the Pharisees among those who accepted their beliefs. By appropriating the role of modern prophets, they maintained the right of free prophetic utterance. That is, they claimed the prerogative to speak the current will of God without the necessity of appealing to the Scriptures. They did not believe they had to be shackled to the teaching of the Scriptures! This opinion gave the Pharisees extreme latitude. They believed, as Herford puts it, "IN THE CONTINUOUS PROGRESSIVE REVELATION OF GOD, AND THAT HIS AUTHORITY WAS MADE KNOWN IN THE REASON AND CONSCIENCE OF THOSE WHO SOUGHT TO KNOW HIS WILL, AND NOT ONLY IN THE WRITTEN TEXT OF THE TORAH [the law of God]" (Talmud and Apocrypha, p. 73). The ideas and beliefs of the Pharisees originated in their own minds! The Pharisees claimed that the Holy Scriptures alone were NOT SUFFICIENT to give the complete truth of God — especially since environmental conditions change. To the Scriptures, they claimed, had to be added the so-called traditional law (which they determined to be the Word of God). "THEY [THE PHARISEES] UPHELD THE AUTHORITY OF TRADITION AS SUPERIOR TO INDIVIDUAL INTELLIGENCE, and taught that no Scripture should be of unauthorized, or private, interpretation" (Conder, Judas Maccabaeus, p. 203). With the "feeling" that they had the spirit of God guiding them, the Pharisees began to make more laws and commandments of their own, without appealing to the Scriptures. The first Pharisee we have record of who began to teach new commandments of his own, without any Scripture basis, was Joseph ben Joezer. This Pharisee lived at the time the majority of the Pharisees erroneously accepted the traditional laws as the "Oral Law of Moses." His first law permitted the Jews to eat an insect related to the locust family which all Jews previously had considered unclean! Also, he permitted the Jews to eat of the liquids of the slaughtering place (apparently blood, etc.). This, of course, was contrary to many Scriptures (Lev. 3:17, etc.). His last commandment concerned the touching of a dead body. He permitted persons to be ritualistically clean even if they were in constant contact with individuals who had become unclean by touching a dead body (Lev. 11:27, 31, etc.). For making all these new laws, which permitted people to do what had been previously forbidden in the Law of God, he was named by his contemporaries "Joseph the Permitter." "Joseph is called 'the Permitter,' evidently because in all three decisions he permits things that were formerly considered forbidden" (Lauterbach, Rabbinic Essays, p. 219). These three new commandments were not the only ones to be enacted by the Pharisees. The action of Joseph the Permitter was the setting of a precedent! His commandments were a little reluctantly received at first, but the reluctance did not last long. From that time forward a FLOOD OF NEW COMMANDMENTS began to come forth from the Pharisees. Now notice what Herford says concerning these three new commandments (Halachah) of Joseph the Permitter. "The Mishnah [a part of the Talmud] records three halachahs which were declared by him... but which evidently met with some objection and gave occasion to his colleagues to call him 'Joseph the Permitter.' This was because... he was able to declare THAT to be allowable WHICH TILL THEN HAD NOT BEEN ALLOWABLE, SINCE NO INTERPRETATION OF THE WRITTEN TEXT [the word of God] HAD BEEN FOUND WHICH WOULD JUSTIFY HIS CONCLUSION" (Talmud and Apocrypha, p. 67). "It is therefore evident that these Halakot... were not older traditional laws transmitted by Joseph as a mere witness, BUT JOSEPH'S OWN TEACHINGS. HE WAS THE ONE WHO 'PERMITTED' AND HE DESERVED THE NAME [the Permitter]" (Rabbinic Essays, p. 218). Because Joseph the Permitter was one of the chief leaders among the Pharisees immediately following the Maccabean Revolt (168-165 B.C. ), other Pharisees immediately followed his authoritative example and made new commandments or Halachah on their own. This method of teaching was not whole-heartedly accepted by all Pharisees immediately. It took about a generation to establish the new method of teaching firmly among the Pharisees. If the majority of Pharisees agreed with the new commandments, they would then be accepted as the Word of God — even if the commandments taught just the opposite from the teaching of the Scriptures. IT ALL DEPENDED UPON WHETHER THE PHARISEES, AS A WHOLE, THOUGHT THE NEW COMMANDMENTS WERE NECESSARY FOR THE PEOPLE TO OBSERVE. "The lead which Joseph ben Joezer had given WAS FOLLOWED, but only gradually; and though the theory of the Unwritten Torah [the traditional laws] was finally accepted and worked out to its furthest consequences, as seen in the Talmud, yet those who most firmly maintained it WERE QUITE AWARE OF THE WEAKNESS OF ITS FOUNDATION. They knew that it cut the connection between the halachah [the rules of the Pharisees] and the written Torah [the Scriptures], and THEY KNEW THAT IN APPEARANCE, AT ALL EVENTS, IT GAVE THE TEACHERS FREE SCOPE TO TEACH WHAT THEY THOUGHT FIT" (Herford, Talmud and Apocrypha, p. 68). Pharisees Viewed Scriptures as Out of Date! Because the Pharisees considered themselves Prophets and able to give the CURRENT will of God, they reasoned that in many cases the CURRENT will of God may be completely different from His will as expressed in past times. They maintained that many of their new teachings, which were clearly contrary to the written Word of God, were actually the PRESENT will of God. This is one of the reasons the Pharisees taught new commandments without Scripture proof! The Pharisees were confident that as times changed and when the people would be under new environmental conditions that certain of the Laws of God, as revealed in the Scripture would, of necessity, become obsolete and have to be changed. And, feeling that they had the power of prophets, they felt no compunction about teaching new commandments to meet the needs of the time, regardless of whether those teachings contradicted the Word of God or not. Herford shows us that this was the very attitude of the Pharisees: "The written Torah was good for the age in which it was given, or in which it was first read; BUT THE WRITTEN TORAH ALONE COULD NOT SUFFICE FOR LATER AGES" (Talmud and Apocrypha, p. 113). With this attitude concerning the Scripture the Pharisees could always maintain that God's will had changed in the matter — that He had revealed His present will to the Pharisees. This is the very same philosophy that is pervading our modern Christianity! How many times do we meet with statements from the learned theologians of the various Christians' sects saying the same thing today? Almost everyone feels that the Bible IS OUT OF DATE — IS OLD FASHIONED. Millions assume it is impossible to keep God's laws and commandments in this "modern" age. Let us clearly understand that the Bible IS NOT OUT OF DATE. It can be obeyed, and in fact, it had better be obeyed! Let us not be like the Pharisees who rejected the Scripture. They received the stern rebuke of Christ. Let us, on the other hand, OBEY — live by — every word of God (Matt. 4:4). From this time forward, we see the development of the Pharisaical Judaism of New Testament times. All the many arduous and burdensome laws concerning the Sabbath — the laws of washing the hands, pots, pans, etc. — laws regarding fasting — and myriads of others had their development in the minds of the Pharisees between the year 165 B.C. and the coming of Christ.